Today is the Navami tithi. Ranchi Sanatorium where I was there from 1995 for long 12 years, is celebrating Sri Sri Jagaddhatri Puja today and tomorrow. This is a joyous annual puja participated with unheard of enthusiasm by more than 20,000 people mostly from rural tribal areas surrounding our Sanatorium. This Puja, began in a small scale, limited only among the patients and staff initially, has grown to become of late an harbinger of communal harmony with intense social interaction where the crowd throngs and mingles and where there is no distinction of caste, creed, language and all become just ‘children of Divine Mother’. Albeit nostalgic apart, I cannot but think of Swami Shantatmananda, the present Head of our New Delhi centre, who used to come every year for performing puja from Belur Math. His one-pointed devotion to Mother Jagaddhatri and his keen sense of dedication with wonderful calmness was a treat to those who would sit hours together in that surcharged atmosphere watching the puja from sunrise to sunset. It is pertinent to note that this memorable puja was indeed started by one in-patient of this Sanatorium in 1958. He was late Bhupati Bose from Howrah. It is said that he had a divine aadesh (Order) in dream one day for doing Devi Puja. The then Head Maharaj late Swami Vedantanandaji rejected his offer saying that doing Durga Puja in a hospital setup was not a joke. But Bhupati, distressed at the decision, prayed to the Mother and sought excuse for his inability to carry out Her wish. Who can eventually stop the Divine Will? He again dreamt of the Mother who said that there was one-day Puja also available! On hearing about the second dream, Vedantanandaji was ready to reconsider his decision and acceded to the patient’s request for Jagaddhatri worship. Bhupati himself prepared the clay image beautifully for consecutive two years. The entire staff and all the in-patients stood together in completing the one-day Puja with great devotion. As per ancient pauranik lore of the Hindu scriptures, soon after the victory over Mahishasur the Devatas became highly egoistic. They thought that because of lending Durga their weapons, the mighty asuras were vanquished. To make them understand that the primordial power is alone behind every action, the Brahman appeared before the Devatas in the form of effulgent Yaksha. Bewildered by its presence one by one the Devatas approached Yaksha. First the god of wind Vayu. The Yaksha asked him what he could do. Vayu replied that he could throw away huge trees, tumble high mountains. The Yaksha then placed a small grass and asked him to move it. Vayu utilised all his powers but lo! he could not even displace it. So also the god of fire Agni, could not even burn it. So also the god of water Varuna, could not even wet it. Likewise one by one the Devatas failed. Ultimately the Lord of all gods, Indra came and immediately understood the inexplicable Power and humbly expressed his desire to know. And it dawned on them that their powers were in reality not their own but derived from the supreme power who as protecting Mother holds the entire creation and therefore called Jagaddhatri. 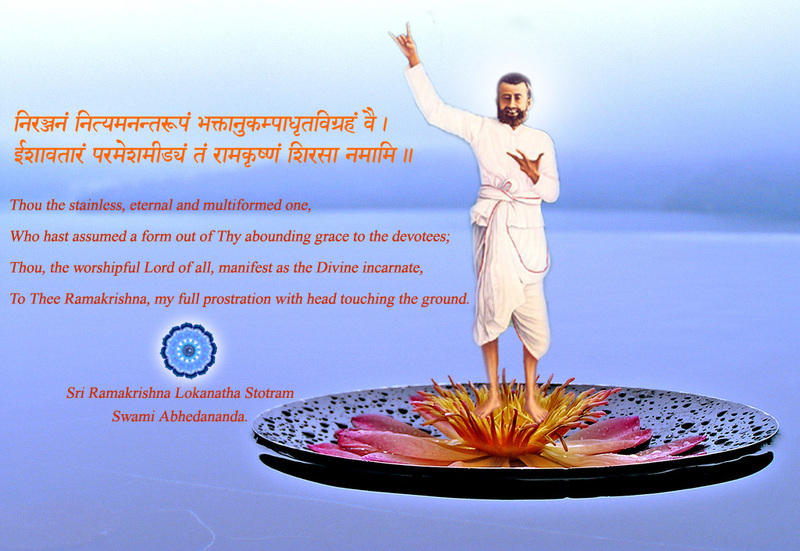 Anybody who worships Jagaddhatri becomes absolutely egoless and is a true servant of the world which is nothing but a manifestation of the Brahman as Sri Ramakrishna had realised. If you want to know more about Jagaddhatri Puja at the Sanatorium with some of the fascinating pictures and a graphic account, please read here. And if you are interested in some more other pictures of Jagaddhatri, please visit this blog. This is so informative, many of us did not know of this part of story, it is so nice. It was so Inspiring to read this wonderful article. Holy Mother used to also worship Divine Mother Sri Sri Jagaddhatri. Would Maharaj please enlighten us more on Holy Mother and and Her worship to Mother Jagaddhatri? Next year, grandmother said to the Holy Mother, Look here, dear, you too should contribute something; my Jagai (Jagad-dhatri) will be worshipped.’ The Mother remonstrated, ‘I can’t bear all that trouble. It’s enough that you had the worship once; why rake up troubles again? There’s no need; I can’t do it.’ Then she saw three figures in a dream at night – Jagad-dhatri, with her maids Jaya and Vijaya – who said, ‘Well, shall we go then?’ ‘Who may you be?’ the Mother queried in surprise. I am Jagad-dhatri,’ said the Deity. At this the Mother said in great consternation, ‘No, where will you go? Do stay on, I didn’t ask you to go.’ Thenceforth the worship continued uninterruptedly for some -years. The Mukherji family had not then enough hands to help in the festival. So the Holy Mother had to be present every year for scouring the utensils and doing some other odd jobs. As the day of immersion of the image on the first -occasion happened to be a Thursday sacred to the goddess of fortune, the Holy Mother objected to bidding farewell to Jagad-dhatri on that day. The next day was the last day of the month, and the next the first day of another -month. Hence the immersion took place on the fourth day. The worship in the first four years was performed in the name of Shyamasundari Devi, in the second four, in the name of the Holy Mother, and in the next four in the name of her uncle Nilmadhav. The Holy Mother felt no need for continuing the worship after twelve years, because all had had their names formally proposed as worshippers. That very night after she had made the declaration, the Deity appeared to her in a dream and intimated that the family of Madhu Mukherji’s aunt had it in mind to worship Her, and asked her three times, ‘Shall I go then?’ The Holy Mother realized that Jagad-dhatri wanted to leave her after getting her affirmation; and so she took hold of the feet of the Deity and said eagerly, ‘I won’t let you go any more, I shall worship you every year.’ With this determination in mind, she later on secured about three and a half acres of paddy land with which she made a trust for the continuance of the worship. With the income from this land and some contributions from devotees, the authorities of the Ramakrishna Math, Belur, perform the worship every year with due pomp, at the Mother’s temple at Jayrambati. And as in the first year, so now too, the worship continues for three successive days – on the first day with all ceremonials but on succeeding days not so elaborately as was the custom during Mother’s lifetime. One on each side of the main Deity Jagad-dhatri, are placed images of Jaya and Vijaya. The devotees of the Holy Mother believe that as the Mother was none other than Jagad-dhatri Herself, when the latter is worshipped the Holy Mother too is adored as a matter of course. We visited Sanatorium during the evening Aarati during Sri Sri Jagaddhatri Puja. We had the good fortune of getting prasad also. As always we were filled with joy but badly missed your towering presence in the Sanatorium. Hope you are keeping fine. I come to know about your whereabouts in South Africa through your blog and some of the pictures of the Holy Trio were absolutely stunning. It is indeed wonderful to note that people in far away SA are so much devoted and drink the nectar of life through Thakur-Ma-Swamiji. Once again our sincerest pronams to you and all other monks and brahmacharis. This year we both went to Ranchi Sanatorium during the Jagaddhatri Puja. Since morning till evening I was collecting donation with Tapan Etc. Collection was good ( About Rs.85 000/-). With the blessings of Maa-Thakur I could do a little service. This morning when I opened my computer, at work at 6.45am, I was so happy to see Mother Jagaddhatri in her full regalia that I have saved her image on my screen. Every time I open my computer, I will see Mother first, she will fill me with intense love and devotion which I in turn, can spread to my staff and patients that i interact with daily. I have Mother Kali with Master & Mother on either side of Her on my desk, now I have Mother Jagaddhatri. What else can I ask for! Thank you Marahaj for this email! I appreciate your instant action in placing the image of Mother Jagaddhatri on your desktop. Yes, how wonderful it would be if only the technology can be used to the furtherance of our devotion, knowledge and such other spiritual qualities! May Mother Jagaddhatri whose worship is done today bless you! It reminds us really the nice puja of Ranchi. Thanks for giving us the inner meaning of Jagaddhatrii Puja as well as history of Jagaddharti puja in Ranchi which was started in 1958 by a patient. When you were in Ranchi, before puja I used to become busy to collect green small coconut which I would send through Revered Joyshankar Maharajji for puja. You would send us, after puja, the vivid description in a Report also. It is really a festival of unity where we can feel we all are children of HOLY MOTHER. What happened to those green coconuts? Are you not sending nowadays? why? Yes, devotees like you from Kolkata would send us always something or the other for the Jagaddhatri Puja. The puja grew so big that there would be people in line to give sarees for the Mother! Such is the popularity of this Puja. The surge of enthusiasm among the local people is exemplary. May Mother bring you peace and prosperity! Sorry to tell you, Maharaj! that nowadays I do not have contact with anyone going to Ranchi and hence I am unable to send things like earlier. Neither I am getting the yearly report etc from that centre. You have God gifted communication skill which makes bridge between monks and devotees. Thank you ever so much for this article. It was so good to come to work on a Monday morning and read this most wonderful article on your blog. What a divine way to start one’s week! Tomorrow being such a special day, commemorating 150 years of the Indian Settlers in South Africa, also being mine and Sanjiv’s wedding anniversary and now, this morning, I find out from your ever delightful blog that it is also Jagaddhatri Puja, truly a triple celebration! I am defintely going to print this article and read to all devotees at tonight’s satsang so they too will be enlightened all about this puja and able to observe this special day tomorrow and in the future. Swamiji, is there any special prasad that needs to be prepared to offer for Ma Jagaddhatri? Yes, for you tomorrow is definitely thrice blessed day! Please accept my hearty wishes for your wedding anniversary. Convey my love to Sanjiv and child Shruti. Your idea to read out the details about Jagaddhatri Puja in the ensuing satsang evening is deeply appreciated. Mother Divine has many forms. Jagaddhatri is one such form that ‘holds’ the ‘universe’. Tomorrow is the visarjan (immersion) day when all the images of the Mother throughout Bengal will be taken to rivers or sea. This Mother likes to eat any saatwik item. So whatever you can, with purity, cook it can be offered to Her. Keep one paan in your offering. Whatever offered with devotion ‘bhaktya prayacchati‘ Mother accepts that. Thank you for this article Maharaj! This also brings back thoughts of our Navarathri Celebration here that are vivid in my mind. How wonderful to also read about our Revered Shantatmanandaji Maharaj! By Mothers Will – I would one-day, like to attend this pooja in Ranchi. My humble regards and saadar pranam. I am happy that you wish to attend this puja in Ranchi. Yes, Ranchi is your Gurusthaan meaning where you were blessed with initiation. You will definitely not only enjoy the incredible innocence of the tribal sisters and brothers but also get inspired by the dawn to dusk puja. May Mother fulfill your desire is my prayer! Having read the blog several times and in particular the Joyous Jagaddhatri Puja, one cannot but help contemplate on the importance of Revered Swamijee’s writings. Although we do not externally celebrate Jagaddhatri puja here, by reading the post and viewing the pictures, we are afforded golden opportunity to celebrate the festival mentally just! What a joy it would be to witness the celebration first hand in Ranchi and in the divine presence of Revered Swami Shantatmanandaji Maharaj. By the Grace of Master, may be someday, we would have the blessed opportunity to participate in the Puja. Hopefully we can accompany brother Yash on his next journey to India. If the writings in this blog have truly generated a wish to witness Jagaddhatri puja and thus make a visit to Ranchi, I should consider that the efforts are well rewarded! On any pretext visiting India is good. So I do appreciate that your wish to accompany Yash is well intended. For your information, Swami Shantatmanandaji, after he took over as the Head of New Delhi centre, is unable to perform the pujari work there due to his other commitments. Yet other monks and brahmacharins are there and yesterday I received three photos by email from a devotee from Ranchi – the photos depicting this year murti and puja. As usual, the murti is so sublime! May Mother Jagaddhatri endow us with devotion at Her feet! The article inspired me to read my emails after the weekend. I went to the article and read the entire article before responding to my duties. A friend remarked when she walked into the office “what a good jumpstart for a brand new working week!”. The article therefore not only inspired the reader but also all the people around the reader! Once again, thank you Maharaj! May Mother’s grace envelope Swamiji! I am happy to learn the kind of responses that this e-medium is eliciting. I had no idea how a blog containing spiritual values could go about – whether it would be welcomed or not. But what I see from the enormous responses, beside the in-built comment mechanism, that I am having through cell SMSes, emails etc, it just overwhelms me. The hits have crossed 70,000 mark! Comments have crossed One thousand mark! May this be ever utilised in His seva! Thanks for your prayers! I had just celebrated my Lakshmi Vrat this Friday, And how glorious to find out that the hymn of Ma Lakshmi contains Ma Jagaddhatri’s name as well! I feel that so blessed to hear Mother’s glories from Swamiji, and today itself I have decided to read that huge book in my prayer room called the “Ramcharitramanasa”! I hope I finish reading. I have had it for many years, and one day, I opened a page of the book, and I was so engrossed! Just the size of the book is a bit intimidating, but with Swamiji’s blessings, I am sure to gain some spiritual knowledge. Our sages have said that the Divine Mother is the cosmic shakti which has three functions viz., shrishti, sthiti and pralaya (creation, preservation and dissolution) and also three aspects viz., sattwa, rajas and tamas (equilibrium, activity, inertia). Ma Lakshmi is the personification of the second function and second aspect viz., preservation and rajas. I am indeed happy that you completed Lakshmi vrat on Friday which was, incidentally sashti tithi – the beginning of Sri Jagaddhatri Puja! In your case, the benefit of reciting hymns is quiet palpable. It has generated and rightly inflamed a thirst for spiritual knowledge. Thats why the large sized book, – however intimidating it might have been – that was perhaps lying in your puja room for many, many years has kindled your interest. Yes, it is only the blessed devotees who get the opportunity to study such grantha (books containing spiritual knowledge). So, Go ahead, read small portions, get to know the story line and the understanding will be given by Lord Sri Ram. Sri Krishna says in the Gita that ‘dadaami tam buddhi yogam’ – “I bestow the Yoga of Understanding”. Therefore, not to worry if you don’t make ‘head and tail’ now of any portion, in due course, the right understanding will be provided by the Lord Himself. May you all in the family be threaded by devotion! At first i want to thank you for your mails & blog. The blog about Sri Sri Jagaddhatri Puja is very informative. I didn’t know the story of Sri Jagaddhatri Puja according to ancient pauranik lore of the Hindu scriptures. Happy that you learnt something new! Yes, did not Sri Sri Thakur say, “jaawat baanchi taavad shikhi” So long I live do I learn? Our sages say “jnaanam anantam” infinite is the knowledge. Who can claim that he knows everything? I remember one Tamil proverb: “katradhu kaialavu, kallaadadhu kadalalavu” What is learnt is palm-sized, Not learnt is sea-sized! May Mother bless you with ever increasing thirst for knowledge! I am really excited to see the blog. My son Kaustav was interested to donate the cost of idol. But it was late. Alpanadi has already donated. Then I approached maharaj for donation of ashtomi puja. Thank God! he accepted it. Maharaj! I was so happy at least Mother has accepted something else. I visited puja at 9.30 A.M with one of my friend who, every year, donates subscription for puja but never visited ashram. I was surprised to see that she was crying. She said that she was seeing the deity whom she worshiped everyday. One Maharaj has came from Belur Math. He was interested to visit here after reading Anomita’s book. He is a terrific singer. Yesterday, we saw one Yatra – Noti Binodini. Excellent play, as if Thakur has come down on stage. Happy to note that you enjoyed reading the posts. When any good act is performed, know for sure that is done by His Grace…and we are just instruments. When the time is right then one will call on the Lord with devotion, just as your friend did. She is indeed blessed! Try and visit the ashram regularly and read our scriptures to keep the mind pure and healthy. the images of Diwali celebrations are absolutely marvelous. It seems from the photos that the devotees are honoured to welcome you. It must have been a grand affair. I used to get engrossed whenever I heard you speaking in a function. By the Grace of Thakur, I am keeping well. Yes indeed! the auspicious occasion of Jagaddhatri worship still remains fresh in my memory. The reciting of the mantras on Divine Mother really transports one to another dimension. I am happy that you enjoyed viewing the pictures. The devotees and well wishers here are truly wonderful and sincere in their devotion to our Holy Trio. Convey my pranam to Revered Swami Purnanandaji Maharaj. Take care and keep in touch. Hope Ayan in USA is doing well. How is Tinku? Visited the Sanatorium during Jagaddhatri Puja and had prasad. We all miss your graceful presence during the pujas. 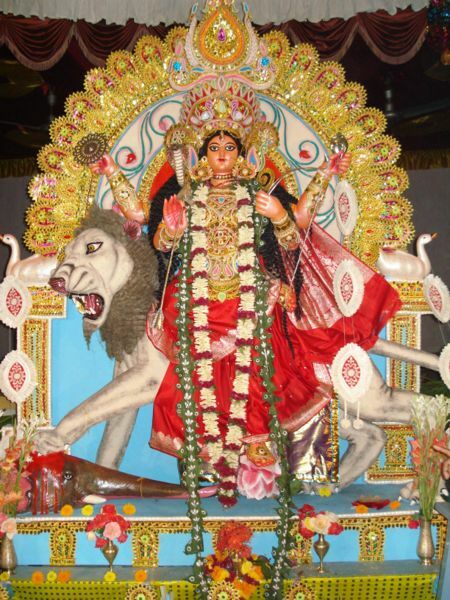 I want to organize puja of Mata Jagaddhatri, but I want support. How this huge puja can be organised, please tell me. If some body is interested to help me in this holi aim, I will be obliged. Moreover, I want such a puja platform where there will be no bar of caste system.